Blues legend Taj Mahal put on a performance as grand as his namesake Friday night at Crossroads KC. The Taj Mahal Trio opened with an instrumental that showcased Mahal’s tasty fretwork. Mahal may not win a notes-per-minute competition, but few musicians are as articulate on their instruments. From there the trio delivered 90 minutes of great blues that was firmly rooted in the genre’s sharecropping/plantation origins, but wasn’t afraid to detour into world music and pop melodies. The result was an evening that pleased both the tourists and the purists. The set started strongly with “Done Changed My Way of Thinking,” and “Checkin’ Up on My Baby,” which featured Mahal on a hollow body electric guitar. “Blues With a Feeling” found Mahal seated behind a keyboard and delivering part of the song in French. Mahal’s instrument of choice often played the dual role of both the seducer and the seduced, and he wasn’t afraid to sprinkle dirty old man jokes between numbers or moan in a rasp that recalled Howlin Wolf to make his point. 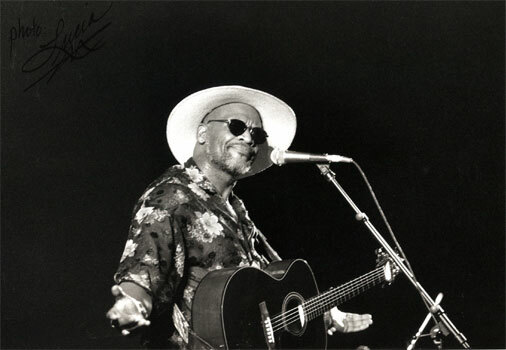 The highlights came when Mahal strapped on an acoustic guitar and performed, in succession, “Fishin’ Blues,” “Queen Bee” and “Corrina.” He said good night, but within a few minutes he started strumming “M’Banjo” and then led his rhythm section through a spirited “You’re Gonna Need Somebody On Your Bond” and “Lovin’ In My Baby’s Eyes,” a beautiful pop ballad that in an alternate world would have been a big hit. The biggest disappointment of the evening was the turnout. Crossroads was only a third full — about 700 people — and most of the crowd resembled the lot that used to turn up at the old Grand Emporium. Mahal deserved a wider audience, but those who were there knew they were lucky to be hearing a legend, still in his prime, do what he does best.